Cherries are part of the Rosaceae family which include almonds, apricots, peaches and plums. Cherries are a small, round and red/reddish-black color fruit that has a hard pit on the inside. There are several varieties of cherries; the two that are eaten most often are the wild or sweet cherries Prunus avium (a.k.a. black/dark cherries) and the sour or tart cherries Prunus Cerasus. The cherries often sold in bulk for eating are the sweet cherries. They are darker in their deep red color. The tart cherries are less often eaten as they are sour but is known to be highly effective for relieving gout attacks. Sour cherries are more often used in culinary and baking where the sourness can be reduced in cooking. Tart cherries are very rich in health-supporting flavonoid polyphenolic antioxidants such as lutein, zeaxanthin and beta carotene. Cherries are low in calories and are an excellent source of complex carbohydrates, protein, and dietary fiber. They are rich in vitamins such as folate, niacin, pantothenic acid, pyridoxine, riboflavin, vitamin A, C, E, and K.
Cherries are also a great source of minerals such as, calcium, copper, iron, magnesium, manganese, phosphorus and zinc. 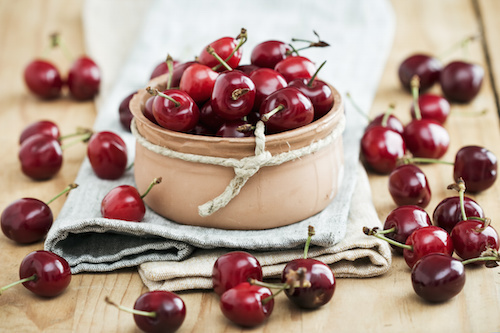 Due to cherries’ high content in antioxidants and anti-inflammatory phytonutrients found in its rich red hue, they have so many ailments/disease-fighting properties. Anti-Aging: Cherries are high in antioxidants that help the body neutralize free radicals that cause the body to age. Tart cherry juice consumed daily can help slow down the aging process and is recommended for improving skin conditions and many other ailments. Blood Pressure: Sweet cherries have a high content of potassium that is a natural blood-pressure reducer. Potassium stabilizes fluids in the body, which offsets the blood-pressure-raising effects of sodium. Studies have suggested that people eating potassium-rich foods, like sweet cherries, have less hypertension. Cherries also contain quercetin, which is an antioxidant that can help keep blood vessels calm and limber. Cancer: Sweet cherries contain beta carotene, vitamin C, anthocyanins and quercetin—these nutrients can work synergistically to help fight cancer. Anthocyanin cyanidin might help stop genetic mutations that can cause cancer and prevent cancer cells from growing out of control. As cherries ripen, they produce more antioxidants so the darker its hue the better. Colon Health: Cherries contain quercetin, which is a flavonoid that has anti-carcinogenic properties. They might help to heal damaged lesions which might cause tumors in the colon. Diabetes: Sweet cherries are lower in glycemic, compared to other fruits, which make them a good choice of fruit snack for people with diabetes or blood sugar level issues. Ease muscle soreness: Tart cherries are rich in antioxidants that can protect against attacks by exercise-induced free radicals that often lead to painful inflammation if uncared for. Eyesight: Sour cherries have about 19 times the amount of beta-carotene (a pre-cursor vitamin A) than blueberries do, making it an excellent food for vision and skin health. Fibromyalgia and gout: Fibromyalgia and gout arthritis are inflammatory conditions caused by too much uric acid in the blood. The swelling and inflammation can cause painful tenderness in the body. Cherries help lower uric acid levels and reduce C-reactive protein, which is a sign of inflammation. 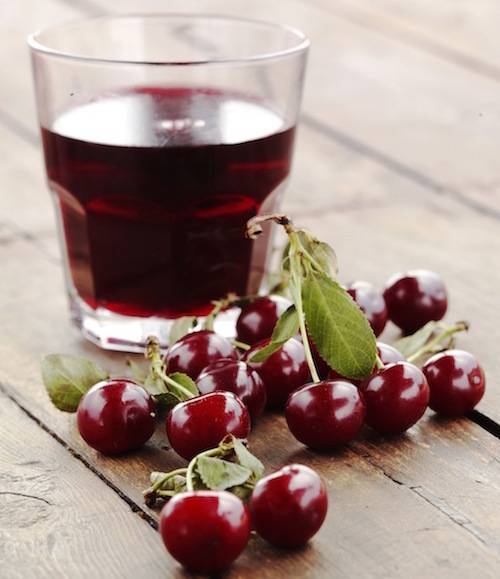 Eating about 30-40 tart cherries daily have been said to help reduce gout attacks and their intensity. Drinking it in juice form may increase the absorption rate and its effectiveness. Sleep: Tart cherries have a natural source of melatonin, which is a hormone that lowers body temperature and helps you to fall asleep easily. It promotes deep and restful sleep that enables the body to rejuvenate and restore in the night. Stroke risk: Cherries contain anthocyanin and various antioxidants that have been linked to lower risks of blood clotting that may cause stroke and thrombosis. They prevent hardening of the arteries and improve on blood circulation that also help reverse issues of blood pressure, glucose and high cholesterol levels. Weight loss: Tart cherries have certain properties that help increase fat burning and may decrease stored fat. When you are shopping for cherries, choose those that have shiny skin and reasonably hard with green stalks that are firmly attached. Cherries can be prepared by removing the stem, wash them in cold water and pat dry with a paper towel. Ripe cherries can be eaten whole including the skin, to reap the maximum benefits. Cherries can be eaten alone or made into a fruit cocktail with peaches, pineapple, pears and grapes.